The Hilton Columbus Downtown will provide an amazing hospitality offering including a sleek modern look /and technology to match/ a location that will accommodate and delight travelers and a commitment to sustainability that will be supported by both the LEED and Green Seal Certifications. The combination brick and glass facade will compliment the neighborhood surroundings. And speaking of the neighborhood the Hilton Columbus Downtown can be found right in the center of all that is happening in Columbus. The hotel is connected to the Greater Columbus Convention Center and is surrounded by the Arena District the Short North the North Market downtown Columbus and a short drive from the The Ohio State University and German Village. You can catch a NHL Blue Jackets or a Columbus Clippers baseball game visit unique art galleries and shops exceptional restaurants and become a part of the local flavor and history of Columbus. Stay in the hotel and be delighted by the main lobby which will feature a large atrium together with skylights designed to provide an indoor/outdoor experience. The hotel will have 532 contemporary guestrooms offering both king bedded and two queen bedded accommodations including 48 beautifully appointed suites. Hotel*s amenities will include a full0-service restaurant offering breakfast lunch and dinner a coffee bar and lobby lounge fitness facilities indoor pool and more. Groups and meetings of a variety of sizes can be accommodated in the hotel and if more space is needed it will be a simple walk through the stunning glass sky walk to the Greater Columbus Convention Center. 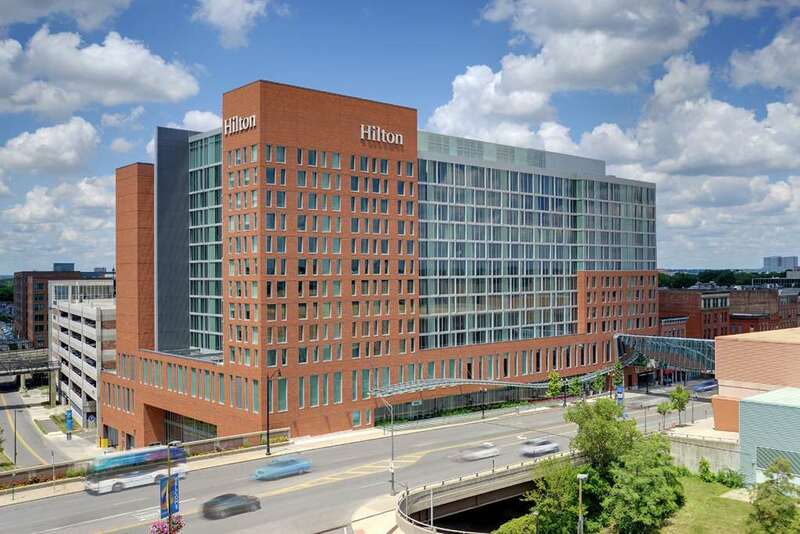 The Hilton Columbus Downtown will be the place to be in Columbus. Provisions on High: Our newly renovated cafe Provisions on High proudly brews Crimson Cup Coffee. Enjoy our hand-crafted drinks and decadent pastries every day or grab a late night snack or beverage for later. Gallerie Bistro: Gallerie Bistro showcases local produce in a menu of French-inspired bistro cuisine. Enjoy informal lunchtime snacks and relaxed evening meals in the laid-back modern environment. Gallerie Bar: Relax with a chilled glass of wine or refreshing fruit juice in the beautiful atrium setting of the Gallerie Bar at the Hilton Columbus Downtown hotel. The bar offers the perfect contemporary setting to unwind and sip aperitifs with colleagues family or friends.